As a certified athletic trainer and director of several large sporting events, properly and adequately hydrating participants is one of my standard safety concerns. There are multiple solutions available to provide hydration depending upon budget and number of participants. These options range from bottles and coolers to cups, hoses and drinking stations. 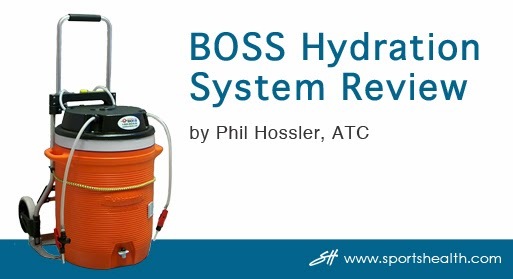 In reviewing products, I was intrigued by the BOSS Drinking System. About two decades ago, I actually thought along these lines and developed a lid with a hand pump idea. I was glad to see BOSS refine this idea to one of battery power. The product seems to be well conceived with a lid that does not have to be exclusively used on ONLY their coolers but can be used on any screw on 7- or 10-gallon cooler. Often the large 10-gallon coolers can be too heavy for many high school age athletes to transport so the inclusion of a cart by BOSS was a nice touch. The BOSS system provides a four hose assembly with auto shut-off capabilities so that when not in use the nozzle can shut off to conserve battery power. The power is provided by a 12-volt DC rechargeable battery. There are, however, some possible negative points that I would like to explore. There are several vendors that carry the BOSS system. I found Sports Health to be the most detailed and offer the greatest variety of combinations. If I had the chance I would like to actually use the BOSS system, but my school budget will not permit me to do such an experiment. It appears that the cart may not be substantial enough to last long with the weight of a 10-gallloon cooler. It appears to be aluminum and the arm holding the actual cooler should be longer to reduce the axial load at the fulcrum point. Sports Health does a nice job, actually better than www.outdoorboss.com does explaining the different options available.